The declining number of African-American players in baseball hasn’t merely changed the demographics of the sport, it’s changed the way the game is played. It’s not just black baseball players who are missed, it’s black-style baseball: stolen bases and over-the-wall catches. That’s the brand of baseball I grew up on in the 1980s. That’s when Rickey Henderson terrified pitchers every time he reached first base. It’s when the 1985 St. Louis Cardinals won the National League pennant with 314 stolen bases and only 87 home runs, a ratio you’ll never see again. And not coincidentally, it was the peak of African-American participation in major league baseball, a three-year stretch when 18 percent of the players were black. 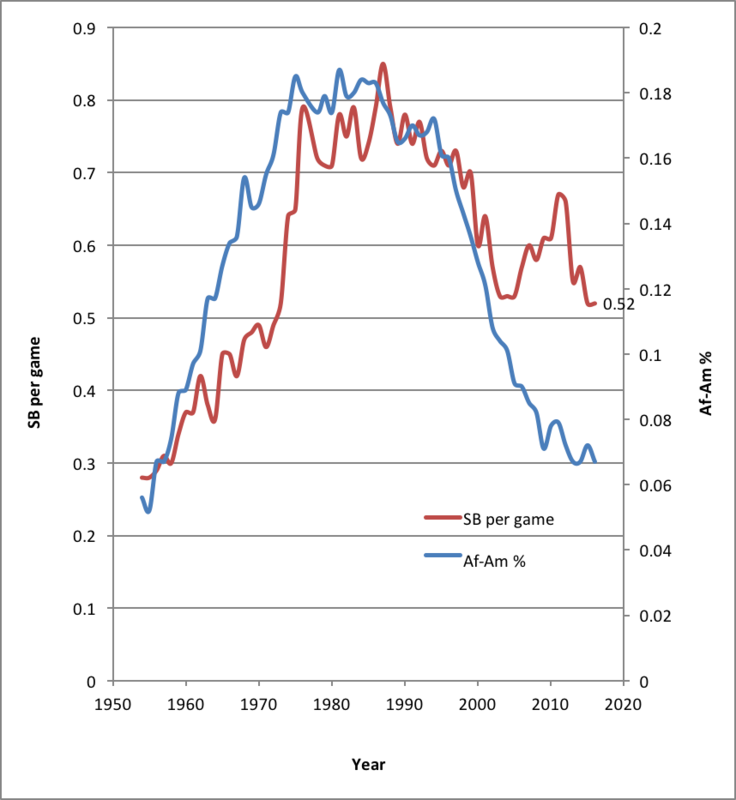 Now the percentage of African-American players in the big leagues is 7 percent, the lowest it’s been since the 1950s. And teams average half a stolen base per game, numbers similar to the early 1970s. Roberts’ own transition from player to manager helps illustrate the story. In 2006, when Roberts was playing for the San Diego Padres, he stole 49 bases. In 2016, in Roberts’ first year managing the Dodgers, his entire team stole 45 bases. So much for running. The movement is down to a trot around the bases or a walk back to a dugout. Mostly it’s a lot of standing and swinging. It’s becoming more like golf than baseball. Yost’s team tried to bring the fun back. In 2015, the Royals ran their way to the World Series championship, highlighted by Jarrod Dyson stealing third base and doing the Yung Joc dance while his team was down by a run in the bottom of the ninth inning — clearly one of the swaggiest moments ever in baseball. “We weren’t a big home-run-hitting team, so we had to try find other ways to manufacture runs and getting guys into scoring position,” Yost said. Yost likes to quote former manager Jimy Williams’ line that to be a base stealer you’ve got to have a little larceny in you. Larceny. What a great word. You take out base stealing and you take out words like that. Plus you lose some of the essence of the game itself. For Roberts, a single stolen base was the defining moment of his playing career. He turned the 2004 American League Championship Series around and initiated a seismic shift in baseball history by stealing second base in the ninth inning of Game 4 when the Boston Red Sox were on the verge of getting swept by the New York Yankees. Maybe the need to do anything to win in October will bring out more stolen bases when the playoffs arrive. Maybe. “I think that, still, in the postseason, to have that guy who can steal a base in these close ballgames, it’s going to still have proven value,” Dave Roberts said. “But over the course of 162 games … teams don’t make it as important. Until then, all we can do is watch and encourage Billy Hamilton, the Cincinnati Reds center fielder. His game is built on speed. So he runs down fly balls at the wall and scores from first base on a single and steals more bases than anyone in the big leagues today. It would be great for the game. More running, less standing and swinging.